As Muslims, the phrase “Alhamdulillah” اَلحَمْدُلِلهis an integral part of our deen; we are taught to say it from both the Qur’an and Sunnah and most of us have this phrase in our everyday vocabulary, not to mention we read it every day in Suratul Faatihah. ‘Alhamdulillah’ is an amazingly deep word, which would take pages upon pages to explain properly in English (which has been done by the scholars) but the explanation that follows is very brief so that we can convey the core of what this phrase really contains. Linguistically, Hamd is from ha-meem-daal ( حمدor حمد) and hamd to mention the good attribute of a person, such an attribute that is the at the level of perfection. Hamd is based on mahabbah (love) and ta’dheem (honor). Hamd is not a ‘fake’ praise, meaning it is not done to please the person or without significance, rather Hamd is always true. Hamd implies admiration, love and magnifying the praise of the mahmood (one who is praised). Hamd can only be done for a living being who has an intellect. Hamd is a sincere and true praise, a praise that the mahmood (one who is praised) deserves. The one doing hamd is doing submission to the one being praised out of humility. Hamd also includes sincere gratitude and mentioning the kamaal (best) traits of someone. 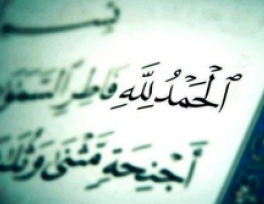 When we say ‘alhamdulillah’, it implies exclusivity and entirety, meaning that praise is entirely and only for Allah. How do we know this? The ‘al’ (ال) before ‘hamd’ is called “istighraaq” in Arabic, and when “al” comes before this phrase its means that the entire praise, all kinds of praise and at all times, is due to Allah. The “li” ( لِin lillah, meaning, for Allah) implies limitation which is known as “ikhtisaas” in Arabic and it means that Allah is the only One who deserves the hamd. 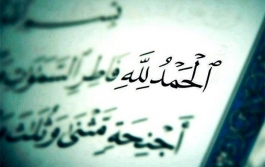 ‘Alhamdulillah’ appears 38 times in the Qur’an.